Overall, this car does exactly what I expect it to do. It was cheap and it's really good on gas. If it were a $20,000 car I may have some complaints, but at $14000 for the top of the line model I can't complain. The exterior is something that the car reviewers love to hate. They say it's a 90's throwback, looks like a mid 90's Hyundai and so on. I could not disagree more with those opinions. No, this car does not have the alien bug-eye looks of the Spark, the euro flavor of the Fiesta or the I wish I was a Honda Fit looks of the Versa Note but it does look modern and fresh with aerodynamics as the primary focus. I purchased a Mirage ES CVT with the exterior appearance package in Sapphire Blue and I love the way it looks and I have gotten a few compliments on it. The paint is very shiny and smooth and everything fits together nicely and neatly. Is it the trendiest looking car of the group? No, but it looks pretty good especially with the ground effects package. Now the 14 inch wheels are another story. They will be changed eventually for a larger and more stylish set. I heard the reviews on the interior and there are some things that I agree with and things that I do not agree with. First I will address the "interior made of plastic" comments. Yes the interior is made of plastic. In fact I do not think that any reviewer can name a car under $45 grand that does not have an interior made of plastic. If they are meaning that there is a lack of any soft touch plastics then yes that is true. For me, not having soft touch plastics on the door panels means that my dogs nails will not poke a hole in it while she looks out the window. I couldn't less about the dashboard because I am not sitting on it or touching it other than to wipe it down when I am cleaning the car. The things that matter to me are the things I have to touch and use everyday. The steering wheel feels nice and has a durable leather on the wheel. The buttons for the audio and cruise control feel like they come from a much more expensive car. 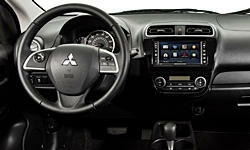 The buttons for the automatic climate control feel good and again, IT HAS AUTOMATIC CLIMATE CONTROL! The stalks for the turn signals and wipers have a nice feel to them and the window switches feel nice as well. The gauges are easy to read and everything is where it should be ergonomically. Yes, it is missing a center armrest. That is one improvement that I feel needs to be done although I will take care of it myself buy purchasing one aftermarket. The seats are comfortable for me and I am a big guy (6' 2" and 300 pounds). There is plenty of head and leg room both front and rear. The seating position seems a bit on the high side. I wish that it could be adjusted about an inch or 2 lower. The fabric on the seats feels really nice right now but I am curious to see how it will wear. It does not feel extremely durable but only time will tell. Yes, you do hear noise while driving but it is no different than any other car I have been in that costs less than 20 grand. In fact, I would not say that it is much louder than our 2013 Grand Caravan while cruising. You do get a lot more engine noise when accelerating or passing compared to our van, but it is totally acceptable to me. Everything seems well put together and in general I am really impressed considering it's price. This may be the part the the reviewers have the biggest complaints about and I can understand what they are saying, but I again feel a bit different about it. The steering is responsive yet very dead feeling on center. It does not center itself after a turn. It is very easy to turn and has an amazing turning radius. Yes this car has lots of body roll around turns and the suspension is very softly sprung, but after driving a car where every bump felt like torture, this car feels so comfortable to drive. The roads in Cleveland are terrible and full of holes and ruts and this car just floats over most of them. I have managed to avoid the large holes so far so I can't really say how it will handle those and hopefully I can keep it that way for a while. I can see where a rear sway bar would really help out the highway handling. On the highway while on a curve you can feel the rear end wallow when you hit a bump. It feels like the rear springs are made of marshmallow. I know that this can be fixed in the after-market but it really is something that should be taken care of by Mitsubishi. It would really help with how the car is perceived. Other than that, this is the BEST riding small car I have EVER been in. People that have been in the car so far have felt the same way. It is so nice to drive to work and not feel every single bump. The ride is one of the main reasons why I bought this car. If you are buying this as a commuter or even for highway cruising the ride can't be beat. If you are looking for a car to tackle the twisties or hit a racetrack then you should look elsewhere or be willing to do some suspension upgrades. I do not think that most professional reviewers understand the point of this car to truly get the point of this engine and transmission. 3 cylinder engines are louder by nature and they will vibrate more. Is it annoyingly loud? No. Does it vibrate your teeth out? No. The engine has the right amount of power for this car. I can get onto the highway just fine and pass on the highway just fine. The CVT is smooth, although not as smooth as some CVT's you will find in a Nissan product or a Honda Fit. 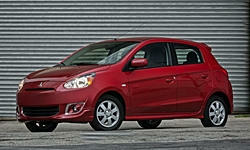 I read somewhere that the CVT in the Mirage is the same as some Nissans but maybe Mitsu tuned it this way for a reason. Because of this engine and transmission you will get AMAZING gas mileage. Even if you want to push the car I can't see you getting less than 35-37 MPG. If you are easy on it, I can see you getting closer to 50 MPG. The engine has an actual timing chain that does not require changing until 100,000 miles and oil changes are recommended at 7,500 miles. That alone will save a lot of money in the future. Overall, I am glad that I picked this thing up. I like the way that it looks and rides and I am already loving the gas mileage. It will save our van from getting tons of miles on it and save us money on gas. I do want to do some upgrades on it but I think I will drive it for a year before doing anything. Probably some bigger wheels and tires and maybe a rear sway bar. Comfortable, cheap, good on gas and long warranty. What else can I really say? It sounds like you understand your priorities, and have refreshingly reasonable expectations of a car in this price range. 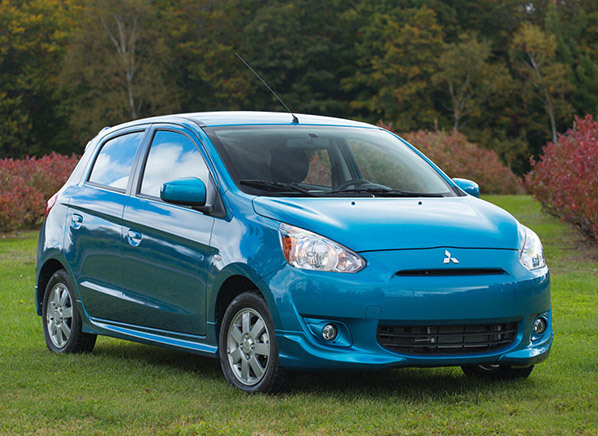 I like that there is a manufacturer out there that will still offer a simple subcompact such as this. I was wondering if you considered purchasing a lightly-used, higher-content car when you bought the Mirage? I think my biggest issue with the car is that while it is inexpensive, it's not so much less so than a much better-equipped two-year-old Civic / Elantra / Mazda3 / ect. Great, informative review; thanks for sharing! I did not consider a used car. Actually, I would never consider a used car. Could I have gotten a used Civic for 14 grand? 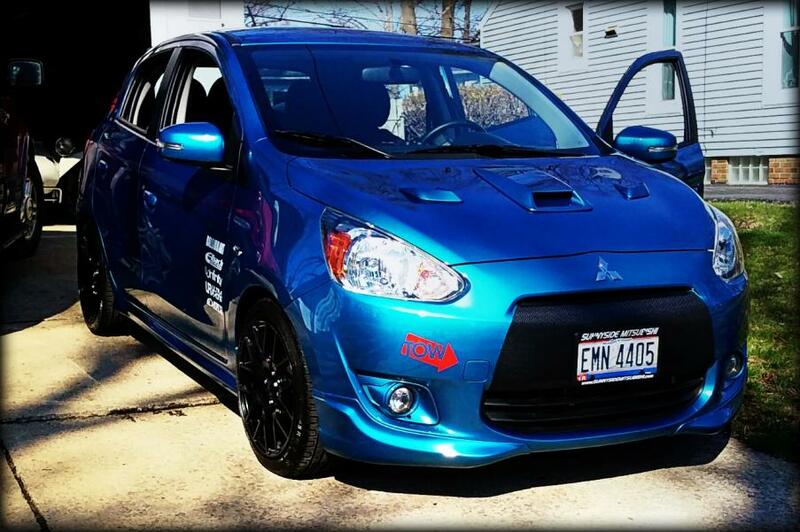 Sure, a 2012 with 20-40 thousand miles. Would I be happy with that? Not really. I see the way people drive their cars and have no desire to ever own something that someone else has owned. I live in Cleveland where the potholes can be out of control after a long winter and I see people everyday hit those holes without even trying to avoid them, open doors into other cars, have kids eating in them and so on. Most of those cars were formerly leased and the people who have them treat them like rental cars because they are just going to give them back in a few years. Stains on seats and carpet, odd smells and scratches and dings are the thing of nightmares to me. Let's not even get into the sporadic or non-existant maintenance! Plus, I can get an amazing APR financing a new car compared to a used car. I can see what people are saying when they say that you can get a "lightly" used car for the same price. If having auto down passenger window or telescoping steering wheel are important features to them, then yes they should go used. If they are looking for features like navigation, heated seats, leather and so on then they are looking at a car that is signifigantly older and with a lot more miles than what I would consider lightly used. I was not limited to a certain budget when I bought this car, I could have paid 3 grand more and got a Honda Fit (actually they were at the same dealer) but the Mirage is totally fine to drive me to work everyday. I'm considering the Mirage for my family when our current second car (a 2006 Kia that is still going strong) needs to be replaced. I really like your review and, for what it's worth, you are among a LOT of happy customers, judging from the Mirage forums. This is one of those cars that gets generally bad reviews from the "experts" but enthusiastic reviews from actual owners. I trust the owners every time. I've read a lot of discussions where people call the Mirage a horrible car and recommend the Versa/Versa Note or the Spark instead, but neither of those cars get very good reviews from actual owners. I'm lookinga at a 2015 with 10k miles at a dealer for just over 8k to replace the VW I've owned for 13 years just for the much better mileage (26-30 now). I'm almost exactly your size and it would be a second car. Would hate to get rid of the nearly trouble free Jetta but you make this car sound good as do other owners. How's the traction in winter I have studded snows on the 5spd Jetta as I live on a 45 degree slope. I live in Cleveland so we have a decent amount of snow and ice and I have not had any issues with the traction. That is even with the standard Enasave tires that are hard as a rock and designed for fuel economy. I think the reason why it is good in the snow is because the tires are so skinny. I remember having a 1990 Hyundai Excel when I was 16 and it had really skinny 13" tires and it was amazing in the snow. Now that does not mean I would not get snow tires for it, especially if you have a hill to get up. I will be getting some mounted on the factory rims this fall. We had a really mild winter last year and it was not an issue but it is best not to take chances because we could have 10 inches drop at anytime as well. I have over 20,000 miles on this car so far and I still do not have any real complaints. The interior is holding up perfectly, no squeaks or rattles, nothing but oil changes so far. I guess if I had to nitpick I would say that the paint is very thin. It does scratch and chip pretty easily, so if you decide to get one I would suggest applying that clear spray on film that they sell to keep the paint protected from road debris. Maybe the people who have bought these cars are just used to driving older subcompact cars from the 80's, 90's and early 2000's, so the things that professional reviewers dislike, people like us do not care about. The direct competitor is probably the Chevy Spark and since my sister in law has one of those I got to see what it was like before I bought the Mirage, and I would not trade the Mirage for the Spark. The Spark is cramped inside (very narrow) and has ZERO trunk space when the seats are up and although it has about 10 more horsepower, it feels slower.